« How could we accept nuclear doom as an option? START Treaties. Negotiations of the first strategic arms reduction treaty began with Reagan and Gorbachev, were completed by George H.W. Bush in 1991 and went into effect in 1991. Under this treaty, the United States and the Soviet Union agreed to limit themselves to deploying 6,000 nuclear warheads to be delivered by 1,000 intercontinental ballistic missiles, nuclear submarines or nuclear bombers. 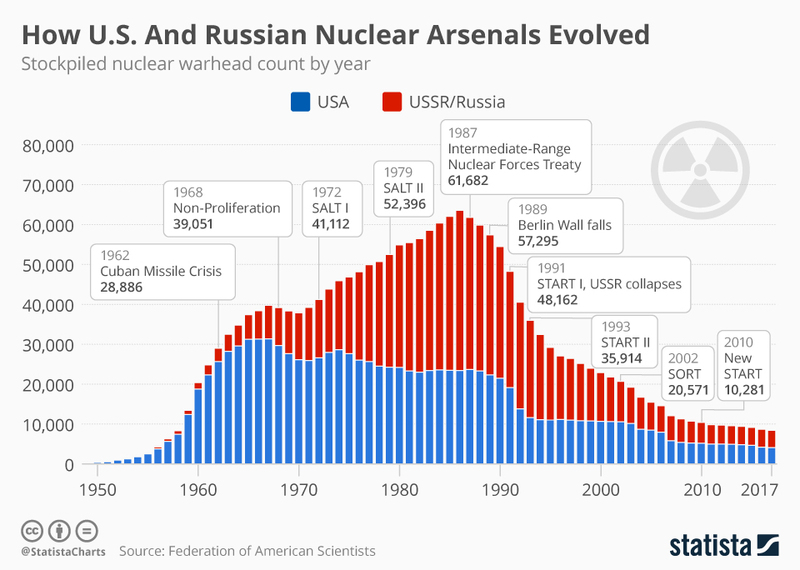 Under the new START treaty, negotiated by Presidents Barack Obama and Dimitri Medvedev, which went into effect in 2011, the limit was reduced 1,500 deployed nuclear warheads on 700 ICBMs, nuclear subs or nuclear bombers. This treaty is up for renewal in 2021, and there’s talk that it may be allowed to lapse. The argument is that the treaty only binds the United States and Russia, and leaves the U.S. vulnerable to a nuclear arms buildup by China or other countries. One answer is to negotiate a nuclear arms control treaty with China. But I don’t think China or any other country will agree to limits that lock in American and Russian nuclear superiority and leave them possibly vulnerable to a nuclear first strike. The START limits, on the other hand, would allow room for a comparatively large Chinese buildup. The path ahead isn’t clear. But a new nuclear arms race would be bad for everybody. The nations of the world are comparable to tenants of an apartment building in which there are tons of TNT in the basement, and a few of the tenants own detonators. Arms control agreements mean reducing the amount of different types of TNT and getting rid of certain kinds of detonators, while leaving enough of both to blow up the building. This is not an answer. No sane person, however, wants to add more TNT. U.S.-Russian Nuclear Arms Agreements at a Glance by the Arms Control Association. Nuclear Weapons: Who Has What at a Glance by the Arms Control Association. Russia bids farewell to INF Treaty with fresh nuclear development plans by Matthew Bodner for Defense News. US withdrawing from a nuclear arms treaty with Russia | An arms race may be next by Alex Ward for Vox. Arms Race: Will Europe By Victim of Nuclear Power Plays? by the staff of Der Spiegel. Jon Wolfsthal on the link between nuclear strategy and the nuclear modernization budget, an interview of a former special assistant to President Obama on national security policy for the Bulletin of the Atomic Scientists. This entry was posted on February 8, 2019 at 4:15 pm and is filed under Foreign Affairs, War and Peace. You can follow any responses to this entry through the RSS 2.0 feed. You can leave a response, or trackback from your own site. Repealing arms control treaties is a really bad idea. Installing limited ABM systems in Poland and Romania won’t affect the balance of power at all but it does make for fine kabuki. At least US ABMs aren’t nuclear anymore. You have hit that nail squarely on the head. If either party doesn’t adhere to a treaty, the treaty is void. If Putin breaks it, IMHO, Trump doesn’t need any justification to withdraw. But why would we? Withdrawal from INF is a really bad idea. Just because Putin does something doesn’t mean we have to follow him down the rabbit hole to duplicate it. I don’t see any gain for us if we do. We have enough nukes to send the Russians back to the stone age a couple times over. Bouncing the rubble a couple more times won’t accomplish anything. there are so many missiles, yes, you are right. Now the question is who might really use it first and if the country who does not push the button quick enough is destroyed or if the entire earth is destroyed? What is the argument here? Are you saying that removing limitations on nuclear arms makes us safer. The first part of the comment rehashes speculative claims from the 1970s and 1980s. You can determine their basis by looking at the chart above. Are you saying that Ronald Reagan was wrong to negotiate nuclear arms reductions with Mikhail Gorbachev? It is true that the tearing up of arms limitations treaties is leading to a dangerous new arms race with Vladimir Putin’s Russia. This is a reason for new negotiations and agreements before things get out of hand. The second part of the comment suggests that catastrophic nuclear winter could be a solution to catastrophic global warming. That’s not an experiment I care to make.